It’s no news to us – artificial intelligence (AI) is changing the world and how we live. From self-driving cars, crowdsourcing apps, location finders, virtual assistants, among many others, AI is making leaps forward. We are also transforming the landscape of the workforce with these new products and services, though some of this is happening in the background. It's time to bring these shifts into the foreground. The biggest question that comes to my mind is how is our work changing? As a part of my final quarter of my MBA at Santa Clara University, I am fortunate for the opportunity to complete an independent study with Terri Griffith [tg: Thank you!]. Part of my work involves providing an analysis of eight reports on AI and the workforce. Independent Workers: AI is likely to support shifts in workforce structure, hiring more people with specialization in certain technology areas or processes. Many believe that independent workers tend to be more prepared than traditional employees, and also have diversified and broad skills. New Job Categories: While AI may displace some work, the majority of work impacted by AI will cause adoption of new skills. Even with automation displacing some tasks, the demand for new work will increase as economies grow enabled by technological advances. That said, the predictions are all over the map. New Job Skills: Employers are seeking people with a broad range of skills, with emphasis on problem-solving, creativity, social skills, and emotional intelligence. Note that jobs that need these skills are less likely to be computerized across some reasonable timespan. Terri Griffith: I’m honored to be sharing this space with one of Santa Clara University’s MBA students. Athena Floro is in her last term and is doing an independent study project with me on Artificial Intelligence and Work. She can be reached on LinkedIn, Twitter, & Facebook. This is a backgrounder for her work and I’m looking forward to her next posts and analysis. Despite some differences, one common denominator across all the reports is the need to bring awareness and preparation to the current and future workforce. This means providing skills training for the current workforce, and also, redefining curricula at all levels to align with the evolution of AI. While the eight reports provide large-scale analysis of how and why we need to be thinking about AI, these claims warrant thorough research, analysis, and discussion. 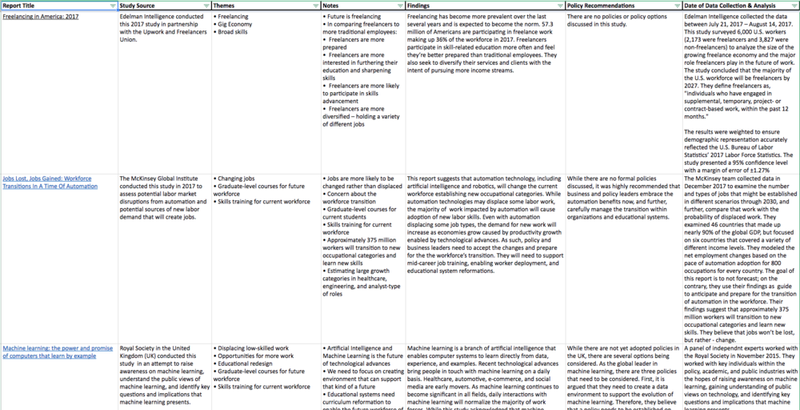 We created this table to summarize the articles’ key themes, findings, and the methods used to support their positions. We hope to update this as more major analyses appear.